Yesterday the Pentagon presented its recommendations to the White House for how to defeat ISIS. It is likely that the military campaign that will follow President Trump's final decision will look a good deal like President Obama's, albeit with looser restrictions, and possibly a dimmer view towards Iranian influence in Iraq. Meanwhile, the Pentagon, the State Department, and the National Security Council are all hard at work formulating a new approach in Afghanistan. They must resist the temptation to recommend an "accelerated" but largely similar approach to the president. What the last administration was doing to fight ISIS was moving too slowly, but at least it was moving in the right direction. ISIS is already on the road to defeat. In Afghanistan, however, the best you can say is that we are in a stalemate with various insurgent groups, most prominently the Taliban. Afghanistan has always been a more challenging problem than Iraq, even if the policy community has failed to appreciate this for years at a time. The problem is not due to stupid clichés to the effect that Afghanistan is the "graveyard of empires"—the country has spent much of its history being ruled by external powers. It has more to do with its weak tradition of central government and the fact that its Pakistani neighbors are heavily invested in preventing the rise of a strong Afghanistan with an independent foreign policy. As I wrote recently, Pakistan's interference is driven by fears that Afghanistan could align with India, thereby posing an existential risk to South Asia's Islamic Republic. Any continuation of an American commitment in Afghanistan must reformulate our strategy with this regional calculus in mind. Of particular interest for this policy debate is a report prepared by Christopher Kolenda of the Center for a New American Security. Aside from highlighting the stunning fact that the U.S. has spent more money in Afghanistan than it did on the Marshall Plan, in real dollars, and that we continue to award Pakistan $742.2 million each year—in effect arming our adversary—the report contains a number of thought-provoking recommendations. Kolenda rightly argues that it is time to get tougher on Pakistan, with measures that include "suspending major non-NATO ally status, designation as a state impeding counter-terrorism efforts, suspension of security assistance, targeted actions against specific individuals and organizations for supporting militant groups, discouraging future IMF bailouts, and designation as a state sponsor of terrorism." Kolenda also proposes further cultivating a U.S. partnership with India. Such steps are welcome. But Kolenda proposes a tough line on Pakistan in part to bring Islamabad to the table for a grand bargain on Afghan neutrality. Kabul, backed by the international community, would declare itself neutral on questions of regional alignment, in return for pledges of non-interference from its neighbors. This is, at best, far-fetched. Any strategy that relies on the Pakistanis (not to mention the Iranians) to pledge anything in good faith is unlikely to succeed. India and Pakistan, with China watching from the sidelines, are engaged in a dangerous standoff in which the stakes, considering the two countries' nuclear arsenals, are survival. Rather than try to bring about a fragile balance that takes Afghanistan out of this equation, we should accept that Afghanistan will always be a factor in Indian and Pakistani decision making, and use that fact to achieve our own purposes in the region. What are those purposes? Aside from a general preference for order over state collapse (which, when it happened in Iraq and Syria, led to the rise of ISIS) the United States is in Afghanistan in order to prevent it from becoming a Taliban-controlled space from which another 9/11 could be launched. But after sixteen years of war, this justification grows ever weaker. There are plenty of places from which organizations like al-Qaeda and ISIS dream of harming the west—Syria, Yemen, and Libya top the list—and we do not occupy them with thousands of American troops. Sometimes a lean counter-terror strategy makes sense. If we choose to continue to fight the re-establishment of a Taliban state in Kabul, we need to get smart, and we need to figure out how such an effort fits into a broader, regionally integrated strategy. We must reduce our focus on building the Afghan state and on helping it control terrain outside of major population centers. The Afghan state, with sufficient international assistance to forestall its collapse, will have to build itself over time. Rather, we should expand the battlespace to apply pressure on the Taliban in places it does not expect and where it cannot resist—specifically, on its sources of support. Such a battlespace expansion therefore ought to include diplomatic measures targeting Pakistan. In addition to Kolenda's recommendations, we should explicitly link our support for India to our effort to fight the Taliban. If a pro-India Afghanistan is what Pakistan fears, then let's give it to them. India has long had a low-profile assistance footprint in Afghanistan. Why not encourage and facilitate the enlargement of that footprint? The existence of a Pakistani nuclear arsenal makes some nervous about applying too much pressure on Islamabad. While we must plan for catastrophic scenarios like a Pakistani state collapse, the fear of such an event is a trump card that Pakistan cynically plays to forestall international pressure before it is applied. Moreover, Pakistan has long been building a relationship with China to hedge against a possible break with America. Fine. Let Beijing pay Islamabad's bills—and let's see how much both sides prefer that arrangement. Our attention should not be oriented on the terrain controlled by the Taliban, or on the quixotic project of turning Afghanistan into a western state, but on the true sources of support for the insurgency within the Pakistani state. We must be prepared to inflict pain on those sources in creative and unconventional ways. Afghanistan will only be secure when such men decide the pain isn't worth it anymore, or if they conclude that their support for the insurgency is having the unexpected effect of weakening their regional position. If the culpable elements of the Pakistani state then cease to provide succor and refuge for Afghan insurgents, a negotiated solution will become possible—and not before. A tougher line on Pakistan could fit well into a long-term, integrated U.S. strategy for the Indo-Pacific region. In light of communist China's regional and global ambitions, New Delhi's democratic government is a natural ally for the United States. Further alignment would make sense even if we weren't already dealing with an insurgency in Afghanistan. 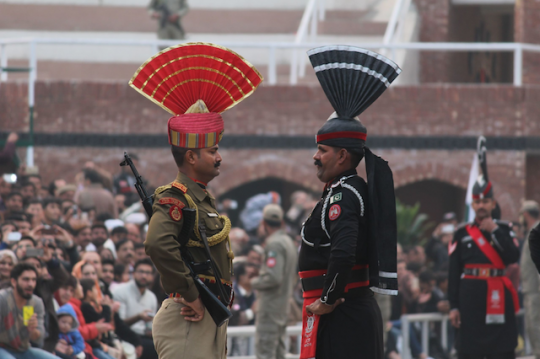 If Pakistan insists on forcing a closer U.S. alignment with India at its own expense—so be it. This entry was posted in National Security and tagged Afghanistan, India, Pakistan. Bookmark the permalink.